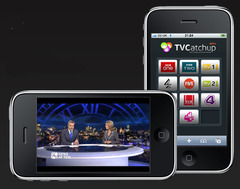 TV Catchup lets you stream UK TV live onto your iPhone. It’s a mobile site that skims the fringes of legality and lets you watch most British TV channels live on your phone including the BBC, ITV, Channel 4 at the same time as it broadcasts on TV. As for the streaming of course – best to do it over wifi, streaming TV is a lot of data. After a series of court battles, TV Catchup is currently legal, but we note on the TV CatchUp wikipedia page it says that a fresh wave of law suits were launched against it in June 2010, by Channel 4 and Five. Problems come because it’s letting you watch TV as it’s actually happening. Being a mobile site rather than an app, it’s open to any person with an internet-enabled smartphone.. – pretty useful. And for providing great content for free, it’s great. iPhone users: go to http://www.tvcatchup.com/iphone on your phone’s browser to pick it up. It’s a brilliant website – and it’s works pretty well over 3G too. That’s why it says British TV as it is for UK only. The same as US has US TV only and so on, international copyright laws I suspect.